"We Make War More Like Foxes"
Military men and historians are drawn to the great, decisive battles, the sort in which grand tactics and sweeping moves dominate, and the fate of a nation or cause decided by sunset. In this period, most fighting was in sieges despite the grip the great battle has on the mind. 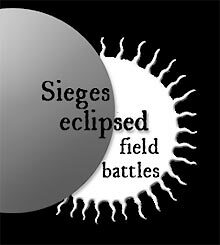 Sieges were a part of overall strategy on the one hand and use of small-scale tactics on the other, but were not the golden middle of grand tactics. Overall strategy, example: to gain control of the western Mediterranean, the Ottoman Turks had to gain control of Malta. To take that island required laying siege against the defenses of the Hospittaler Knights of St. John. The Turks did so in 1565 (then relented and sailed away after two hard-fought months). Small-scale tactics, example: Forays were employed during many sieges by nameless sergeants, lieutenants, captains and colonels directing as few as a half-dozen men to make damage upon the enemy. Even if the damage was a pinprick, perhaps the enemy could bleed to death with sufficient numbers of pinpricks. The prevalence of this last mode was reflected in John Cruso's remark in 1632: "The actions of the modern warres consist chiefly in sieges, assaults, sallies, skirmishes, etc., and so affoard but few set battels." Although as many men could die during the length of a siege as could in a grand battle, the former stretched over months whereas the latter was done in a day. Sieges enjoyed the favor of princes and generals even in this because the loss day by day was usually dribbling and thus easier to justify (or explain away) than a loss of thousands within hours. For one measurement of the proportion of siege warfare to that of great battles in the field, consider the career of Count Maurits van Nassau. The Count and Willem Lodwijk, his cousin, devised new methods of deploying soldiers for grand tactics, and their studies went on to change fundamentally how soldiers were used. The Count led his Dutch forces in one battle of maneuver, Nieuwpoort in 1600. By comparison, he led the Dutch in taking 38 towns and 45 forts by siege, five towns and ten forts by surprise, and relieved Dutch forts under siege 12 times. Compare one accomplishment for grand tactics to 110 for siege-related leadership. Reflecting upon the recent history of his Europe and war of his time, Lord Orrery is said to have remarked in 1677: "Battells do not now decide national quarrels, and expose countries to the pillage of conquerors, as formerly. For we make war more like foxes, than like lyons; and you will have twenty sieges for one battell." And, like the earlier Middle Ages, patience became mandatory.